Photo courtesy of Bob Pristash and the Evansville Purple Aces' twitter handle. Following a heart breaking loss at Wichita State, D.J. Balentine and the Evansville Purple Aces bounced back in a big way with an obliteration of Bradley. EVANSVILLE, INDIANA---Less than a year ago on February 7, 2015, D.J. Balentine's Evansville Purple Aces surrendered a 30-16 halftime lead in a 56-53 upset to the worst team in the Missouri Valley Conference, the Bradley Braves. This afternoon, the opponent and location was the same and the halftime lead very similar in size, but the result was not. Propelled by 16 points from leading scorer D.J. Balentine and 13 by junior Blake Simmons, Evansville had no trouble thrashing the freshman-filled Braves 67-35. Completely shutting down Bradley for the first four plus minutes, the Purple Aces immediately jumped ahead to an 8-0 advantage, which later turned into a 21-6 lead. But that's not all! With two minutes remaining in the first half, Evansville was up 33-14! D.J. Balentine had 10 points individually, which was only 4 less than the Braves! And to this journalist, the story of the game came in a small 49 second span at the end of the first. Bradley's Donte Thomas had just produced four consecutive points, which drew the Braves within 15 (33-18). Big momentum swing right? WRONG! Attempting to get a good look at the basket to end the half, Balentine nailed a fall away three in the corner just as time expired. Momentum gone. And sadly, if you thought the following was bad, it became even worse for Bradley. Despite netting the first basket of the second twenty minutes, a Thomas dunk, the Braves 18-point halftime deficit grew from 19 to 32 in a matter of eight minutes! This one was officially over. Coming off a single-possession loss at Wichita State and becoming the first team in almost three years to stay within a possession of the notorious Shockers on their home floor, Evansville walked into the Ford Center with a trap game in front of them. But, they must have already knew it since they demolished their opponent by 32 points while shooting the ball at 55%. 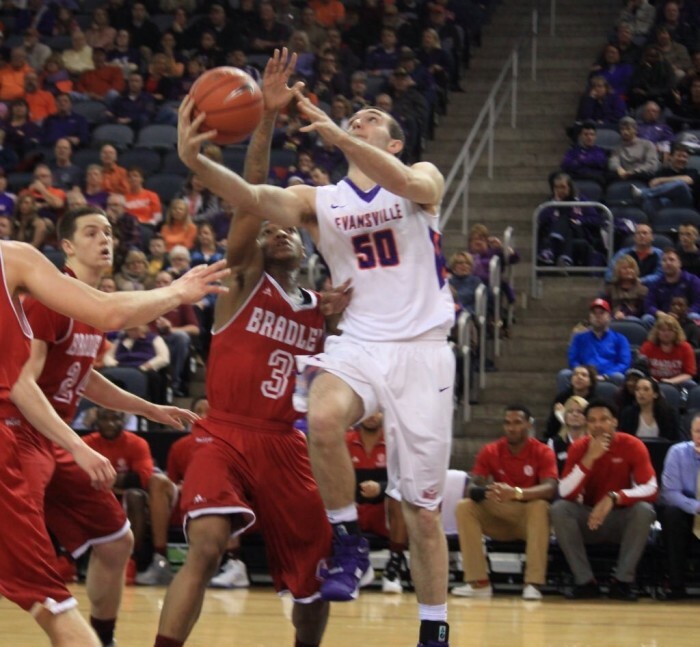 Additionally, by holding Bradley to 35 points, the Purple Aces broke a Ford Center record for points surrendered (44). The 14-3 (3-1) Evansville Purple Aces will play host to the Drake Bulldogs Tuesday evening. Starting five freshmen for the second time this season, Brian Wardle had to know today would be a battle, if not a debacle, against one of the Missouri Valley's best. And without a doubt, it was as they fell to their eleventh opponent by double-figures, fourth by 30+ points, while the year of brutally struggling with youngsters continued. On the afternoon, the team housed in Peoria shot an anemic 26.1% from the field to go along with 23.5% from beyond the arc. In fact, the only player who individually shot over 50% was Donte Thomas, for he was three for four with 11 points. Everyone else was held at or under 6! 2-15 (0-4) Bradley will stay on the road and head to Chicago for a date with Milton Doyle's Loyola (IL) Ramblers in a battle of winless conference teams on Wednesday. "We're losing games and we got some guys always picking up fouls early in the game and then are on the bench the whole first half. Just a little tweak. Scottie (James) earned an opportunity and hopefully Donte (Thomas) and Callum (Barker) can bring something off the bench for us." ---Bradley Braves' head coach Brian Wardle on the lineup change back to five freshmen. "They're a year older and they all know their roles and embrace their roles. They take and can make shots, but they take good shots. They're disciplined and physical. They're a very good team." ---Brian Wardle's response to the the differences between this Evansville team and last year's. "We went back to last year when they came in here with a close and similar record and came in here and beat us. So we really didn't want that to happen. Like you said we had just come off a loss (Wichita State) and needed to bounce back fast. The Valley is so tough, every team on any given night can beat you. So we really wanted to jump out on these guys, get a comfortable lead, and keep executing the way we did." "He runs the floor pretty hard every game. He's not been rewarded. He was able to get out and get fouled and make a basket or two. I think that really helped him. He was aggressive off the dribble-drive. Again, confidence is a fickle-thing and when you play with it, it's really good, and hopefully he and the rest of the guys will continue to do that." ---Evansville Purple Aces' head coach Marty Simmons on his son's, Blake, play.